Does Db2 Warehouse on Cloud have high availability? Yes. MPP Small and MPP Large plans support node HA. If one node suffers an outage, work will fail over to the remaining nodes in the cluster. The cluster needs downtime in order to restart the fallen node. Does IBM offer a tool to migrate my on-premises data centers to Db2 Warehouse on Cloud? Yes. IBM Lift will quickly, securely and reliability migrate your on premises data warehouse from your data center to the IBM cloud. What are some examples of the algorithms included with IBM Db2 Warehouse on Cloud? Included in the offering are algorithms for linear regression, decision tree clustering, k-means clustering and ESRI-compatible geospatial extensions. Can my existing IBM Db2 entitlements be used to access selected Db2 Warehouse on Cloud services? Does IBM Db2 Warehouse on Cloud support NoSQL? Yes. 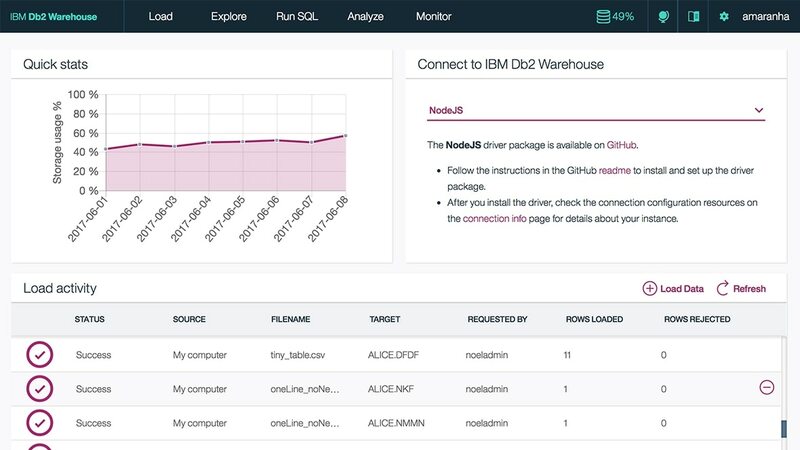 IBM Db2 Warehouse on Cloud integrates with Cloudant to synchronize JSON data within Cloudant to structured data within the data warehouse allowing traditional BI and analytics. In-database predictive algorithms also allow clients using Cloudant to analyze their JSON document stores. Does Db2 Warehouse on Cloud support the (Health Insurance Portability and Accountability Act (HIPPA)? Yes. Db2 Warehouse on Cloud’s SMP Medium, SMP Large, and MPP Small plans are HIPAA-ready. Does Db2 Warehouse on Cloud have Oracle compatibility? Yes. You must indicate on the provisioning form whether or not you require Oracle compatibility. Is Db2 Warehouse on Cloud compatible with my existing IBM PureData System for Analytics? Yes, most of your PureData System for Analytics workload will migrate seamlessly to Db2 Warehouse on Cloud. For the select few edge cases, we offer free tooling to help you make a smooth transition. What data visualization and ETL tools can I use with Db2 Warehouse on Cloud? Db2 Warehouse on Cloud works well with many data visualization and ETL tools including Tableau, Looker, Cognos, Watson Analytics, Data Science Experience, Informatica, DataStage, and Aginity Workbench. In addition, Db2 Warehouse on Cloud provides free JDBC and ODBC drivers for download. What security certifications does Db2 Warehouse on Cloud have? Db2 Warehouse on Cloud complies with several security standards, including ISO 27001 and SOC 2. See our compliance document for more details.